Mark Dalton has had a life-long interest in aviation, military and Cold War architecture. He is a member of Subterranea Britannica and has written many articles for the society's magazine. He is also an Associate Member of the Royal Observer Corps Association. Mark has a degree in Aeronautical Engineering and a Masters and Doctorate in Materials Engineering. He now works in Project Management in the Automotive Industry. He still maintains his links with aviation and flew gliders before qualifying as a Private Pilot in 2009. Mark starts his book in 1915, and in five pages describes briefly the origins of the ROC from Zeppelin raids, the creation of LADA and the setting up of the Observer Corps in 1925 to radar, WW2 and the granting of the title ‘Royal’. Seaborne and D-Day, Terriers, Rats and Orlit aircraft reporting posts are then described. From page six to almost the end, the book is unashamedly about the nuclear role and all manner of aspects of underground ROC monitoring posts. A small exception is chapter 2 which covers UKWMO and various Sector and Group controls. But this book is essentially about posts from the first building at Farnham in 1956 to stand down in 1991 and beyond. Post design and variations and mistakes in building are well illustrated with crisp photographs. Mark, who is a member of Sub Brit and an associate member of the Royal Observer Corps Association, spends much time describing post equipment of various types and developments, again with excellent photographs. Instruments such as FSM (older and more modern), FSM Trainer (clockwork), telescopic rod and clamp, dome cover, RSM Nos 1 & 2, radiac simulator and Eprom, dosimeter and charging unit, GZI and BPI, are all included. Then comes the turn of communications and warning with the telephone head and breast set, various types of teletalk, radios and WB1400, siren and maroon. Chapter 5 describes ‘Life in the ROC’, including recruitment, training, air experience flights and ROC camps. Mark bravely mentions SOP No 1 (Posts), transition to war, the setting up sequence for instruments and assessing readings and data. Slightly unfortunately the ROC nuclear exercise gets very little mention yet it was such an important part of ROC operational life. This chapter suitably ends with stand down in 1991 and the remainder of the book, some 115 pages, covers abandoned and restored posts and the ROC legacy. The account of ‘Abandoned Posts’ is particularly interesting with many good photographs of a considerable number of now disused ROC posts all over the UK. The photographs illustrate different designs, post decay, remaining equipment, some aircraft reporting posts and Orlit A and B Posts. Incidents in posts, post batteries, PE sets, weather reporting and master posts in seemingly never ending pictures of post life. As well as abandoned posts there is a selection of posts which have been later adapted by owners for other uses such as storing wine or use as a bird hide. Mark could not end his book without mention of ‘Restored Posts’. Some fifteen posts are dealt with in this section, not all restored posts by any means, but a good and varied selection. The restored posts are well illustrated with many photographs and the whole account illustrates what can be done when enthusiasts decide to preserve a part of ROC heritage. 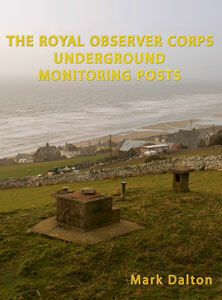 The book ends with a chapter called ‘The Royal Observer Corps Legacy’ in which Mark reviews what posts and controls have been lost and what have been saved. ROC museums, Cold War museums with ROC content are described very briefly and finally the ROCA gets a mention as the organisation furthering the interests of the ROC today. Overall, this book is an excellent addition to the growing list of books recording ROC history. The quality and number of photographs is the best seen to date and congratulations go to Mark for this. The book contains some unusual and seldom reported aspects of ROC post history such as Operation Hornbeam, RIMNET (Radioactive Incident Monitoring Network) and Seismic Posts. The chapter on ‘Restored Posts’ is particularly useful and eye opening. The only very small criticism is that an index would have been useful but this is a small point compared with the many good aspects of this book. Well done Mark!